Featuring 11 Hg in. of negative vacuum pressure and ability to return only clean air, Attic Vac Vermiculite Removal System contains and filters harmful materials and insulation-related carpentry. Material is collected into pre-separator featuring 12 in. 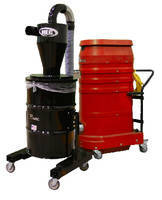 cyclone, 55-gal tipping drum with lifting mechanism, and equalizer kit for bagged collection. Operating at 300 cfm, Attic Vac includes heavy-duty vacuum with 240 V single-phase motor, 28 ftÂ² of MicroClean filtration, and 40 ftÂ² HEPA filtration. Holyoke, MA — Ruwac USA is pleased to announce the latest in its line of specialty vacuum systems, the Attic Vac Vermiculite Removal System. Ruwac understands the necessity to provide a safe vacuum environment while removing hazardous vermiculite without letting dangerous contaminants or construction materials getting in your way. Because of this, Ruwac’s Attic Vac features 11 Hg” of negative vacuum pressure -- the most powerful in the market -- and the ability to return only clean air. The Attic Vac’s strength and durability easily allows it to tackle any vermiculite insulation job by containing and filtering harmful materials and insulation-related carpentry along the way. From there, it’s safely collected into a pre-separator featuring a 12” high efficiency cyclone, 55 gallon tipping drum with a lifting mechanism as well as an equalizer kit for bagged collection, making disposal of all insulation materials effortlessly dustless. Available in 300 CFM, the Attic Vac includes a 240 V single phase motor heavy duty vacuum with 28 ft2 of Ruwac’s industry-leading MicroClean filtration and 40 ft2 of HEPA filter for air purification. The vacuum’s modular housing is fully grounded and sealed for dust-free operation, and made from a dent and rust-free compression cast composite housing that is guaranteed for life. Each Attic Vac Vermiculite Removal System also features a 3” inlet and comes with a 150’ hose, hose connector, 42” wand for quick material collection, and 10 lightweight bulk bags that easily attach to the vacuum and drum. For the most complete removal of blownin insulation, Ruwac recommends adding its 55 gallon Bulk Separator to your Attic Vac. The separator attaches inline between the cyclone preseparator and the vacuum unit. It features a 55 gallon collection capacity and optional burlap bag that ensures safe handling of your insulation material. With so many great versatile features and an easy-to-break-down construction, the Attic Vac’s functionality extends beyond your attic space! Ruwac USA is a leading manufacturer of portable, central and specialty industrial vacuum systems. Made in the USA, Ruwac’s industrial vacuums are known for their reliability, innovative design and superb filtration. For more information on Ruwac’s product lines, visit www.ruwac.com. You can also contact Ruwac by telephone at (800) 736-6288 or via email, info@ruwac.com.